In the book I distinguish four models of extreme and radical democracy. In an assembly democracy, decisions are taken by a popular assembly open to all citizens. In a council democracy, workers’ councils and neighbourhood councils take most decisions but are bound by mandates from the workers or the citizens. In a plebiscitary democracy most important decisions are submitted to the people in a referendum or result from a popular initiative. In a sortitionist democracy, all or most important decisions are taken by a random sample from the population. The following are excerpts from the concluding chapter where I evaluate the four models and sketch a utopian synthesis of all four. (…) a weakness of plebiscitary democracy that often disturbs classical democrats is the lack of serious and thorough public deliberation before the people vote. Debates may be held in the media, but they tend to be monopolised by political and (to a lesser extent) intellectual elites. This seems to happen not only in the press and on television, but also in the new digital media – with a vengeance, if Matthew Hindman is right. Therefore, deliberative democrats like Peter Dienel, Ned Crosby and James Fishkin have designed new institutions to provide for more deliberation among the common citizens. Randomly selected citizens are invited to participate in citizen panels, assemblies or deliberative opinion polls to discuss salient problems and elaborate a solution. Sortitionist democrats have generalised this principle of selection by lot (sortitio in Latin). They argue that randomly selected citizens might be better legislators than the professional politicians elected to parliament or Congress. The latter are often alienated from the electorate, manipulated if not corrupted by particular interests and no longer representative of the average population. Allotted representatives will draw on a much wider variety of experiences and perspectives, coming from groups that are practically always under-represented in elected bodies such as ethnic minorities, immigrants, women or unemployed youth. Sortition is not a modern invention, of course. It was practiced in ancient Athens, to select the Council of 500 as well as the popular courts or juries and the law-makers. It has also been used since medieval times to select criminal and civil juries in the United Kingdom, and later in the US and several other countries. Modern statistics and sampling techniques have given it a new political legitimation, however. Since Gallup developed his sophisticated opinion polls in the US in the 1930s, we have come to identify random samples with the population they are drawn from. If sixty per cent of a sample approves of abortion, we believe ‘the people’ approve of abortion. So decisions taken by a randomly selected citizen assembly are in fact seen as decisions taken by the people. Very few sortitionists want to replace all elected bodies by randomly selected citizen assemblies. Perhaps the Canadian lawyer Simon Threlkeld and the small Spanish Chance Party (Partido Azar) might favour this variety of democratic extremism. I might do them injustice here, however, as their ideas have not been elaborated in detail. Only John Burnheim designed a complete political system based entirely on sortition, which he baptised ‘demarchy’. All political and even administrative decisions are taken by councils consisting of randomly selected citizens. However, the power of each council is far from absolute, it deals only with specific sectors of society such as health care, education or public transport. Hence, the councils may check and balance each other to some extent, as jurisdictions will overlap – a weakness of the system, in the eyes of some critics, but possibly a safeguard against extreme monism. Council members will be selected (at random) from a list of volunteers who will have some affinity or experience with the sector. The voluntary character of the council membership, however, may detract from the democratic qualities of the system and produce oligarchies of full time activists – or of Bolsheviks in a new garb, who might even intimidate rivals and try to monopolise the lists of volunteers. So demarchy need not be extreme democracy; at the end of the day it might not even be very democratic at all. The other proposals discussed in Chapter Five are cautious compromises between allotted and electoral representation. Ernest Callenbach and Michael Phillips, Keith Sutherland, Alex Zakaras, Kevin O’Leary and Ethan Leib advocate different combinations of sortition and election, to extract the best from both worlds. So far, none of these proposals seem to have been tested in real life. Sortitionist democracy seems strong where plebiscitary democracy is weak, and vice versa. Participation is limited to a random sample from the population, which may cause a legitimation problem. There is ample room for deliberation, but the impact is not always clear. Statistical samples tend to be perfectly inclusive, yet if participation is voluntary (as it usually is in citizen juries and similar bodies) self-selection may lead to under-representation of certain groups like ethnic minorities or people without much formal education. However, weighing procedures or special sub-samples might compensate for this. Imagine a city of about a million inhabitants. Obviously it is too large to assemble all citizens on a square and let them deliberate, so it is divided into 100 municipal districts, each large enough to exercise some autonomy but small enough to convene their inhabitants in a large theatre or stadium in the civic centre. The civic centre contains also a public library, a school for civic education and training, sports facilities and a large green area. It is maintained mainly by volunteers who are rewarded with vouchers or free use of the facilities. The district assemblies decide about the district budget and they have to approve all expenditures over a certain amount. They also discuss priorities and proposals for the city budget, as well as problems that should be put on the city council’s agenda. Their preferences can be overruled by the city council but only with a qualified majority. The city council is elected by the citizens, who can recall any member that fails to meet their expectations. Moreover, citizens can veto decisions of the council in a referendum and impose decisions through a popular initiative. And finally, most departments of the city administration as well as corporations which offer a public service such as public transport, council housing, local radio and television, theatres, parks and schools, will consult a users’ council as well as a workers’ or employees’council when they take important decisions. The users’ councils consist of randomly selected registered users or consumers of the services: regular passengers of buses and subways, tenants, regular listeners of the radio, frequent visitors of the theatre or the park, patients of hospitals and health care centres, pupils of schools (or their parents). The selected candidates will be rewarded for their efforts by vouchers or free services. The councils may have a strong advisory status, meaning that their advice cannot be ignored without arguments. In certain cases, e.g. when privatisation, mergers or other drastic changes of the services are considered, the councils might even have veto powers. If participation in the councils or district assemblies would drop below a certain level (say ten per cent of the relevant population), Tännsjö’s rule should apply and representatives should be elected. A similar combination could be imagined at the level of a national (or federal) state. Even if we do not want to replace elected legislatures by a House of Lots (as in Aleatoria), we might combine allotted and elected chambers the way Callenbach and Phillips, Sutherland or Zakaras have suggested. Furthermore, Burnheim’s randomly selected users’ councils could also be tried out at the national level, at least in certain sectors such as public transport, higher education, national parks and museums. The laws passed by allotted and elected legislators could be initiated or repealed by the people in a popular initiative or referendum (respectively). >Examples of extreme democracy are rare, as far as I could find out. The few cases of extreme democracy I found in the literature are short-lived, revolutionary situations, such as the First French Republic between 1792 and 1794 and the Council Republics in Munich and Budapest (1919). All can be contested, however, as reports on these chaotic cases are not necessarily reliable. I agree, there are no precedents for an all-sortition system, so we should suspend judgment perhaps and first try more modest experiments. In the past, however, as far as I know extreme systems have usually led to abuse, tyranny or ended in chaos, so I argue for checks and balances, too, even in the context of radical reforms. Agree 100%. It’s such a refreshing change to hear a voice for moderation on this forum! I’d like to refer you to one such “all sortition” model I described in a couple of academic papers. The first is in the Journal of Public Deliberation. While this is merely theoretical, it incorporates checks and balances and a natural means of self-correction against most tyranny and corruption. in the Systems Thinking World Journal. *** The terminology of Paul Lucardie is bad, as it leads to confuse two ideas. *** An “extremist “ State, following current understanding, is a State prone to few rational deliberation, strong emotional urges, and tendency to step out of the standards of the civilization the State belongs. This can occur during wars, civil wars, revolutionary processes, and is not linked to a specific political model, except two ones; the totalitarian dictatorship with its ruling militant sect, and the personal tyranny when the tyran’s mind is not stable. 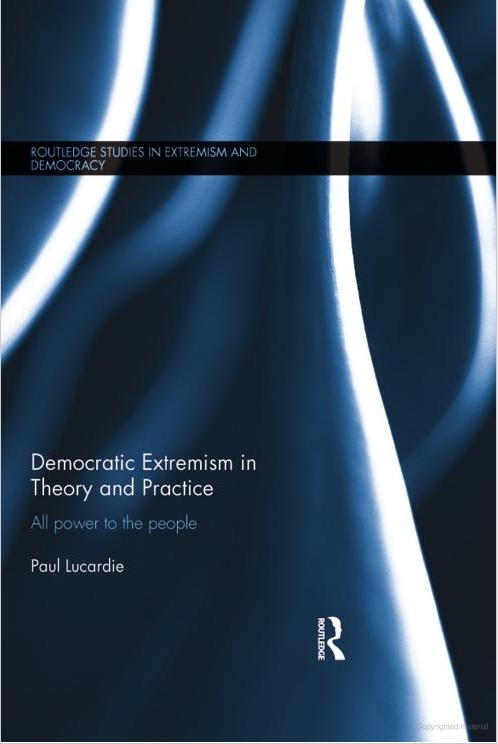 *** The “extremist” political model following Lucardie’s very personal definition is actually a model of simple sovereignty, where there is a definite entity which has the last world. It excludes for instance traditional monarchies, or ancient “mixed” republics like the Roman one, and modern polyarchies (“liberal-representative-democracies”). It includes the ancient “dêmokratia” where the dêmos had the last word (through general assemblies or through citizen juries) and many “aristocratic” and “oligarchic” regimes. The functioning of these systems may include “checks and balances”, as in the Second Athenian democracy, or in the Venetian Republic, but with all the actors having the same political personality, the personality of the sovereign entity, the Athenian dêmos or the Venetian patriciate. Clearly “simple” and “complex” sovereignty are ideal-types. I think that at some moment Great Britain had a parliamentary regime expressing the political personality of a small elite, and we could describe it as an oligarchy. But if we consider the House of Commons and the House of Lords as corresponding to two different elites, it was a complex sovereignty. Now, the heir of the British parliamentary tradition is a brand of polyarchy. *** “Extremism” in the ordinary sense is a natural leaning in a totalitarian regime, where rational deliberation smells quickly of ideological treason. In an aristocratic regime, a “republic”, a polyarchy or a dêmokratia, it will occur mostly in times of revolutionary processes or war. It can be more or less controlled by an institutional scheme allowing for good deliberation – including for instance consultation of all the concerned groups, freedom of speech, rules for rational discussion… The Second Athenian Democracy was much better than the First one, but far from perfect; partly because of practical constraints. Modern technology would allow a high level of rational deliberation in a modern dêmokratia. *** “Anonymous” quotes as possible example of “extreme” democracy the First French Republic between 1792 and 1794. It was among a revolutionary process, with foreign war and soon civil war, and with “proto-totalitarian” undertakings by militant Jacobin groups – not strange to find there “extremism” in the ordinary sense. *** But for all the rhetoric about “the sovereign people”, the power was in the hands either of elected representatives or of militant groups. *** Here we must remember that the Convention, which claimed to “represent” the French people through election, refused (15 January 1793) to submit to the general vote of the people the verdict about Louis XVI. This fact (omitted in the current wikipedia notice about the “trial of Louis XVI” !) is a great symbolic event: very soon after the French people was officially proclaimed sovereign, his “representatives” forbade him to take which was a major political decision. The lie of “modern representative democracy” can be given a symbolic date. *** Actually, France was too big a State to be a democracy in ancient technical conditions, and anyway the social factors were against dêmokratia in this time. Democracy could be only a myth. *** And, logical corollary, I remind that the First French Republic did not accept any idea of democracy-through-sortition. Keith Sutherland says that “an all-sortition system would be a case of democratic extremism, without historical precedent”. *** The dêmokratia is relatively rare in history. It could work, in pre-modern times, only in small States, and, furthermore, it implied political equality between upper classes and lower classes. Modern technology allows for dêmokratia in States of whatever size. As for the class problem, I think some factors in modern societies, as general reading ability and loss of traditional social deference, may give some chances to dêmokratia. *** The difference between ancient times and modern times is so strong that we cannot conclude from statistical past evidence to future possibilities. There are few real monarchies in our world (Saudi Arabia, Bhutan, Brunei …), whereas monarchy was in ancient times a very usual regime. *** The dêmos can be sovereign through general vote or through allotted citizen juries. The formula can vary. In the Second Athenian Democracy, the general vote had the last word in peace and war questions, and allotted juries in judicial, legislative and constitutional questions. A 21st century dêmokratia, in a very complex and dynamic society, would have to make so many political choices about so many subjects (often complex ones) that for the vast majority of them it would not possible to ask for a serious deliberation from the entire dêmos. That means that a modern dêmokratia must be basically a democracy-through-sortition. A modern dêmokratia can include general votes, but only for cases where it is possible to ask all the citizens to give as much time to the deliberation as a citizen jury could. Clearly, it will be exceptional (such a general vote may be considered as a special case of sortition, with scale 1 for 1 !). And if we accept general votes without serious deliberation, the dêmokratia will be phony, as the so-called “opinion democracy’ through opinion polls, which is only a mask for polyarchy. I’m puzzled as to how it’s possible for one sortive body to act as a check on another. Checks and balances in a democracy are generally on account of the problems of a) majoritarian tyranny and b) the demos being gripped by a temporary “humour” (fad/hatred/madness etc.) In the first case every sortive body will be a subset of the same majority so it wouldn’t work. Multiple sortive bodies might address the second case if a long time delay occurred between the different panels, but this would make it difficult to legislate in emergencies. Most checks and balances involve some form of mixed constitution — an upper house appointed by a different principle, supreme court, bill of rights etc — but I don’t believe this is part of your utopian scheme for a “pure” democracy. We must be grateful, as always, for the clarity and scholarship that you bring to these issues. I agree with you that “extreme” is an unfortunate term, “simple” or “pure” would be better. Given that our interest is the section of Paul’s book on sortition, the distinction between simple – vs – complex is not so much dêmokratia – vs -the mixed constitution, but sortition – vs – dêmokratia. Whatever Aristotle may have said about Athens in the fourth century (and scholars such as Hoekstra (2013) think he may in fact have been referring to the Periclean period), it was not a simple or extreme form of democracy. The rhetores (political leaders) continued to generate most policy proposals, the only difference was that they were no longer kai strategoi, and more magistracies were elected, so there was an increased “aristocratic” element. Also, as you rightly point out, decisions were divided between all the demos and an allotted subset. So this would be more accurately described as a complex dêmokratia, a long way removed from the pure/simple aleatorian proposals made on this blog. As you know my proposal is for a modern-day version of 4th century practice and this cannot be sortition alone (including your 1-1 variant). The modern equivalent of the relationship between the rhetores and the demos is, like it or not, the electoral hustings. Although your model of “good deliberation” is attractive from a normative point of view there is no evidence at all that it could work in a representative context — it certainly has no classical analogue (certainly not the adversarial clash and jury decision of the nomothetai). Perhaps this is what happened in the boule, but I’m not aware of any supporting evidence — the scholarly consensus being that the boule was neither a deliberative nor a representative body (Manin, Urbinati and Landemore, 2008). ‘Deliberative Democracy’ would be more accurately described as a product of post-Habermasian Critical Theory (Scheurman, 2006). I would be very sceptical that the ideal speech situation would survive the predations of any simple form of government (democratic, totalitarian, oligarchic etc) or that checks and balances based on a “single political personality” would provide anything more than short-term respite from extremism. The mixed constitution assumes more-or-less even powers between the different estates, on a par with the nineteenth-century doctrine of the balance of powers in international relations (or its twentieth-century counterpart (Mutually Assured Destruction). This is realpolitik, not Habermasian dreaming. The first three models are actually not democratic. “Assembly democracy” and “plebiscitary democracy” are clearly based on mass political mechanisms and are therefore controlled by elites that are the only ones that are able reach a large subset of the public and therefore control the agenda. The “council democracy” model leaves the question of how large-scale decisions are made unaddressed. Without such a mechanism, there is no democratic control of a wide range of crucial issues. In a mixed constitution the checks on democracy are granted to the elite (whether nobility or wealthy, etc.). I don’t see any value in this “check.” If the goal was to protect “minorities” from abuse by the majority, then it would make more sense to have a Senate made up of an abused racial minority, rather than a powerful elite. Why give checking power to a group that is already advantaged? My idea is to provide a check on the people BY the people, by dividing functions into separate bodies. In a simple unitary and unicameral system (whether elected of allotted) there is a risk that the majority will let an immediate policy decision be decided by short term interests of the current majority. But if a separate allotted body is charged with designing rules that any allotted legislative body must use, or rules for protecting the rights of any minority WITHOUT KNOWING THE SPECFIC POLICY OR MINORITY at hand, that body is far more likely to adopt fair rules…They don’t know how to twist rules to their favor, not knowing what issue they might be applied to in the future. It’s as if a group of football players met to agree on rules for future games. They would adopt fairer rules than a group of players who were adopting rules in the middle of a game, where the rule will favor one side or the other. The CHECK comes from the separation of bodies and separation from concrete application in a particular policy situation. The ancient theory of the mixed constitution accepted the empirical reality of actual power. Elites have power and if you refuse to acknowledge this institutionally, they will only pop up again in some other manifestation — that’s why my approach is to quarantine rather than seek to abolish them by constitutional fiat. Arguably this is the source of all political institutions — the English Whig and Tory parties were just the institutional embodiment of the two sides in the Civil War. So, historically speaking, parties and elections didn’t cause conflict, they merely quarantined it in an acceptable manner (jaw-jaw, rather than war-war). Get rid of hereditary monarchs and you’ll end up with elected monarchs. Elites had enormous power in classical Athens, but it was limited, by sortive and direct-democratic institutions, to the power to persuade. Your proposal is more akin to Montesquieu’s slice-and-dice approach — take a single power, cut it up and separate it with leaky parchment barriers and hope that each bit will check the others — that’s why it appealed to the American founders, who could not (for purely rhetorical reasons) acknowledge the existence of estates of the realm. I prefer realpolitik to pieces of paper. Yoram: >The first three models are actually not democratic. Paul, I’m afraid that on this forum democracy is defined as sortition, and any deviation from this doctrine is ruled out as unacceptable (i.e. elitist). The fact that democracy has, historically speaking, come in a variety of shapes and sizes is not deemed to be relevant. Unfortunately this limits the discussion somewhat. Best of luck! What about real democracy in Spain in the 30s? here a documentary about anarchist northern Spain during anarchist people leading times! to be shared! “deliberative democracy, when properly conceived, is the rightful heir of the early Frankfurt School [of cultural Marxism]” (Scheuerman, 2006, pp. 86). “Democracy is for Marx the political form of socialism . . . democratic institutions on this view should no longer be aggregative or based on rational self-interest; rather, they should be participatory and based on richer notions of reason and solidarity. . . The underpinnings of such a notion of democracy . . . are to be found in an historical notion of universal reason.” (Bohman, 1996, pp. 191). That’s certainly the model of democracy espoused by most Habermasians and also many of the commentators on Equality by Lot (hence the frequent insistence that certain policies are “obviously” in the interest of “the masses”). An earlier ruling on this blog by Peter Stone has prevented me from pointing out the Marxist influence on the agenda, but hopefully widening the remit to include Anarchist and Frankfurt School thinkers will not fall foul of the Stone Interdict. Personally I think it’s important to insist that sortition is of interest to a wide range of political thinkers, not just those on the left (Anarchists, post-Habermasian Critical Theorists, Marxists etc.) Anyway I’m glad that people are starting to put their cards face-up on the table and am grateful to Paul for stimulating this move. PS I would also argue that anarchism is not an exclusively left-wing perspective but this is rejected by most modern anarchists (their tent is not big enough to include right-wing libertarians). According to the received wisdom anti-capitalism is a prerequisite for anarchism. Bohman, J. (1996). Critical Theory and Democracy. In D. Rasmussen (Ed. ), The Handbook of Critical Theory. Oxford: Blackwell. Scheuerman, W. E. (2006). Critical Theory Beyond Habermas. In B. Honig, J. S. Dryzek & A. Phillips (Eds. ), The Oxford Handbook of Political Theory (pp. 84-105). Oxford: Oxford University Press. Thank you very much for your links! I did not know the second piece, but did read your fine article in the JPD, unfortunately after I had completed my manuscript. Last week we discussed it in an informal philosophical club here, together with David van Reybroucks book ‘Against Elections’ which warmly advocates your model, as you may know. I am not sure if I would consider your model a case of extreme or pure democracy. I suppose it depends on the way it would work, and in particular the autonomy of the policy juries with respect to the Interest Panels (and other interest groups) and Review Panels, and possibly the executive branch – if there is such a thing in your model. But your checks and balances might prevent the excesses associated with extremism. The way I understand your model you are not cutting up a single power, as the Interest Panels but probably also the Rules Councils and Oversight Councils may in practice be selected at random from different groups. But maybe I misunderstand the model. >the Interest Panels but probably also the Rules Councils and Oversight Councils may in practice be selected at random from different groups. My understanding of Terry’s model is that they are all selected from the one demos, the only differences being the degree of volunteering involved and different functions. If that is the case then a majoritarian prejudice or a temporary mood/inclination that affects the whole population will be common to each panel. This is particularly problematic with regard to the rules council — for an analogy, imagine a football club providing the referee and linesmen as well as fielding their own team. I wonder if ANY governmental organizational principle can reliably protect all subgroups from abuse (tyranny). At least in a democracy it is possible to prevent tyranny against the majority by a minority, which has been the norm in nearly all governmental systems for eons. The question we are grappling with is how to prevent tyranny by the majority in a democracy. The concept of a mixed constitution typically only protects the aristocratic minority that put itself in the privileged position. The black slaves in the U.S. did not gain any minority protection against tyranny by the creation of a Senate (if anything just the opposite). A written Bill of Rights is only as effective as interpretation and implementation allow. The best hope I have been able to devise is the separation of tasks, with an allotted body consciously devoted to defining fair rules, without being swayed by short-term policy decisions. The only alternative I can imagine is a separate chamber made up of all oppressed minorities (though how they are defined is unclear), but clearly an aristocratic chamber has proven to be a nonsensical plan for protecting the rights of minorities other than the aristocrats. It is true that the U.S. Supreme Court has occasionally championed the downtrodden, but more often done just the opposite. Ultimately democracy places sovereignty with the majority (since any super-majority requirement would allow a minority to over-rule the majority). There are, and can never be any Platonic Guardians who are wiser and better than the culture that they come from. Democracy can only be as respectful of minority rights as the values of the culture itself allow. Fortunately most cultures have an element that can be built upon that professes kindness towards minorities, even if that isn’t manifest under current governmental systems. Many thanks for your thoughtful response. I agree that liberals (in the 19th century Millian sense) are concerned with majority tyranny whereas deliberative democrats (in the Critical Theory tradition) are concerned with the tyranny of elites. I think both forms of tyranny need addressing. There is no reason why the two approaches (a mixed constitution and the intra-democratic separation of tasks you propose) cannot be combined, although it would require Yoram and yourself to allow for an aristocratic component in human affairs. Let’s focus on the etymology of the word (aristoi — ‘the best’) and try to remember what it meant before Marx and Freud drowned us all in a sea of cynicism. I appreciate that’s a tough call for those who have grown up in the tradition of critical theory and doubly difficult for a gamekeeper turned poacher like yourself! I also think you are being a little unkind regarding recent efforts by elected politicians and appointed justices to address the problem of minority rights. Surely much of the focus of progressive politics for the last half century has been the position of minorities and it’s often the case of elite liberals (politicians, academics and lawyers) fighting a battle against the innate conservatism of the masses (no doubt the result of the false consciousness induced by millennias of indoctrination). Restricting all powers to popular sortive bodies would put the progressive clock back by decades, as I attempted to demonstrate in the recent debate on feminism on this very blog. I still owe you a reply. I would argue assembly democracy can be democratic, provided the scale is modest and certain rules are respected. Personal observation of the Landsgemeinde in the small Swiss Cantons of Appenzell Innerrhoden and Glarus suggested to me elites do control the agenda but can be overruled, even if they agree among themselves – let alone if they disagree. Admittedly plebiscitarian democracy lends itself very often to manipulation by elites or particular interests. California comes to mind – you know probably more about it than I do. Yet something like the constitution designed by Condorcet in the 1790s, giving deliberative primary assemblies plebiscitarian powers, might have worked – unless André Sauzeau proves me wrong again. At any rate, in a modern mass society sortitionist democracy will probably work better than the other three models – perhaps we could agree on that? Yes. My point is not that in those other systems popular sentiments do not exert any political power. In fact, in any system popular sentiment exerts some political power. The question is a question of equality – what is the distribution of power. So, yes, I think we can agree that a sortition-based system is the one that has the most promise of achieving a fairly equal distribution (i.e., something that may fairly be called “democracy”). It seems that Keith Sutherland is afraid of radical decisions by a dêmokratia leading to irrational or unethical results. He thinks that checks and balance by elite social power forces could prevent such occurrences – if only by slowing or mitigating the decisions. I am afraid Keith shares a bias, very strong in our cultural elites and in our medias: considering asymmetrically the bad consequences of “hard” decisions, the effects of which are direct and/or avowed, and the results of “soft” decisions, the effects of which are indirect and/or not avowed (no-decision being actually a special kind of “soft“ decision). If a foreign invasion causes many deaths in a country, the invader is responsible; if an embargo against a country leads to a much higher level of mortality among babies, not so much noise. Death penalty is a subject of outrage; but if the health system of a country leads to a level of mortality much higher than in other States of comparable economic and educational parameters, no such outrage, even if the victims ore often among these ultimate innocents, the children. Oppressing a minority is bad; but the behavior of French authorities which led to a massive death toll among the hemophiliac minority is easily forgotten. Is really this asymmetry so rationally founded? The bloody and indiscriminate repression of counter-revolutionary Ireland by Cromwell was dreadful? OK. But what about the Great Famine of Ireland? Is Keith Sutherland sure that we cannot ascribe at least a small part of responsibility to the London Government, with all its checks and balances? *** Keith Sutherland quotes often Habermas as father of the idea of deliberation and of deliberative democracy. Without considering here the thought of Habermas – who seems clearly against dêmokratia – the idea of deliberation is not a discovery of a XXth century philosopher! The criminal juries follow rules which are intended (at least partly) to foster good deliberation. We can approve or not these rules as they exist today in France, or in England (they are different, if I am not wrong), we can intend to better them, it is another problem. Whenever sovereignty is given to a definite entity – a king in an absolute monarchy, councils in an aristocracy, general assembly or allotted juries in a democracy (here = dêmokratia), the problem is to allow for information of the sovereign about the issues and the possible choices and for reflection as rational as possible before the decision. What we ask from jurors in a criminal court, we must ask from the sovereign in a political decision, no need to be Habermasian to think that! *** What is strange, actually, is that we require deliberation from a criminal jury before sending a man to death, and we ask much less about a referendum (or an election) the results of which may lead to thousands of premature deaths because, for instance, of a bad health system. *** We can imagine ways to get high levels of deliberation quality in criminal juries, in legislative and policy-deciding juries, in juries monitoring the public managers; and modern technology will help, allowing for instance for multiple-choices votes (not binary votes, as in Athens) and for hearing concerned people very far from here. *** As I said, general vote may be a part of modern dêmokratia, but only in cases the quality of deliberation could be high. The possible cases are to be considered without bias. Although I am suggesting a mixed constitution, please don’t confuse this with a defence of the status quo — in my proposal all final decisions are taken by an allotted sample of the demos. Most people would consider this to be a fairly radical change to our existing political arrangements, even if it falls short of the extreme demands for “pure” democracy of some of the movements outlined by Paul in his book. Gotta go out now, so will have to leave your second post until tomorrow, but interesting to learn that Habermas is not a democrat. This confirms something that I have suspected for a long time but it would suggest that those proposing Habermasian-style deliberation (ie most of the people on this blog) need to think long and hard as to how this affects their own position. There are few rules or even guidelines over what takes place within a UK jury room, only norms, such as “without bias”. The role of the jury is simply to determine the outcome via weighing the evidence heard in court, whereas Habermasians are concerned with “good discussion”. I agree with Andre, that it is the courtroom model that we should pursue, as Habermasian deliberation is not concerned with democratic representation, only the procedural rules that will lead to good discussion. Yves Sintomer argues that what distinguishes Anglo-American from Germanic deliberative democracy is two different derivations of the word deliberation, Latin (“weighing”) in the first case and deliberativestimme (German for good discussion in the second). I am encouraged that Andre agrees that, as democrats we should focus on the jury model, not the production of hot air. Keith Sutherland seems to think (January 10) that “dêmos tyrannos” was a “cliché” in Ancient Athens. It is most exaggerated. *** Orators and playwrights could criticize the sovereign dêmos when he seemed driving into irrational or unethical behavior, as in a traditional monarchy the councilors could criticize the behavior of the king, hoping to put him into better ways. Such criticisms are not inherently anti-democrat or anti-monarchist – in some cases they may cover subversive intentions, but they have to be accepted by true sovereigns, who rule because of their political legitimacy, not because they pretend to be inerrantly inspired by the Voice of God, or of History. *** The great arch-enemy of democracy, Plato, agrees on this point (”Republic”, book VIII): democracy, intoxicated by unmitigated freedom (562c), is actually anarchy, and if, in the standard historical sequence he proposes, it is followed by tyranny, it is because excessive freedom leads to total lack of freedom; “from the height of liberty the fiercest extreme of servitude” (564a) from one extreme to the opposite extreme, as “any excess is wont to bring about a corresponding reaction” (563e). It is far from assimilating democracy and tyranny! *** The theme of “tyrannos dêmos” exists, right, in Aristotle. The philosopher acknowledges the enmity between democracies and tyrannies, but considers that comes from their very similarity (Politics, V, 10, 30; 1312b): democracy is opposed to tyranny “as, in Hesiod’s phrase, ‘potter to potter,’ because the final form of democracy is tyranny”. Note that the “final form”, or “extreme form” of democracy seems the Athenian model, even if Aristotle usually avoids to precise it. The Aristotelian thought about “dêmos tyrannos” mixes actually two ideas. ** First, a “marxist” one (marxist of the right! ); for all the idealistic speeches about “civic community”, the reality is social classes; in democracy the lower classes, being usually the majority, rule, and this is tyranny of the poor, as there is no equilibrium between the classes and as the poor appears prone to class egoism (Politics, III, 7, 5; 1279b: “tyranny is monarchy ruling in the interest of the monarch, oligarchy government in the interest of the rich, democracy government in the interest of the poor, and none of these forms governs with regard to the profit of the community”. *** Second, a constitutional criticism; in “ “extreme democracies”, the dêmos rules by assembly decrees and court verdicts, without following fixed laws (Politics, IV, 4, 28; 1292a) and without leaving the last word to any “magistrate” (Politics, IV,14, 7; 1298a). *** It seems probable that the first criticism was the basic one, linked not only to material class interests but likewise to the wide cultural gap between elite and common people in 4th century Athens. *** As for the second theme, Aristotle usually avoids to precise if 4th century Athens was an “extreme democracy”, and he avoids any mention of the institutional changes of the Second Athenian Democracy. For instance there is no mention of legislative citizen jury (“nomothêtai”) neither in “Politics” nor in the “Constitution of Athens”. Very strange; or very bad faith, indeed. *** Aristotle dares to insinuate that if the ancient democracy gave so power and freedom to women (he uses the word “gynêkokratia”; no need to be feminist to put !!!!! ), it is because like a tyrant, the democracy hopes that the wives will denounce their husbands. I don’t joke; see Politics V, 11, 11; 1313b: “the things that occur in connection with the final form of democracy are all favorable to tyranny—dominance of women in the homes, in order that they may carry abroad reports against the men, and lack of discipline among the slaves, for the same reason”. (translated by H. Rackham). Aristotle’s hate of democracy led his scientific mind up to the verge of nonsense. *** Which is implicit in the lack of information about fourth-century reforms, is the idea they are not relevant. Checks between the assembly, the legislative juries and the judiciary juries are not relevant, because it is the same dêmos. A good regime will include check (veto power) by the social elite, it will be a “republic” (politeia). Your knowledge of Greek history is vastly greater than mine. I was reliant on Kinch Hoekstra’s talk to the Popular Sovereignty Network. Unfortunately the talk is not yet published, but due out from CUP next year I believe. Hoeskstra was clear about the link between democracy and tyranny in the work of the playwrights and Aristotle. I’m not sure why that makes dêmos tyrannos a “cliché”, or are you just questioning whether it was common understanding at the time? I agree with you that Aristotle’s perspective on democracy as the rule of the poor was proto-Marxist and was interested to read somewhere that this would be the case even if the poor were in a minority (I don’t understand what this means). Hoekstra agrees that Aristotle ignores the 4th century reforms and claims that he was referring much of the time to Periclean Athens. Aristotle’s notion of politeia and kata taxin (right ordering) does depend on a balance of power between the social classes and this is why he would not have considered the 4th century reforms to have altered the balance. That would have required an increased role for election. I think he would have viewed democratic anarchy as just an arbitrary form of tyranny in that vacillating decisions are made by a single estate, and the same applies irrespective of the numerical composition of the estate (the one, the few or the many). I would agree with him that constitutionalism requires a mixture of estates, hence my argument for preserving a role for election and meritocracy, rather than purely being reliant on democratic procedures like sortition. While one might choose to forgive Aristotle, and perhaps people as late as Madison in their view that the educated elite (having enough money and time to become so) deserved special consideration within a constitution (I wouldn’t, but I can see how some would)…After all the poor might be illiterate, and easily manipulated by their employers, etc. (so the argument goes). But TODAY Keith? Why should they get a privileged role in governing a modern society? Is your argument that since elites DO exist, it is better to channel them through a constitutional institution, than let them influence things hidden from view. What if a society had no distinct class of wealthy people? Would you favor creating a wealthy class in order to institute a separate Estate to check the risk of tyranny of the majority? I gather not…but then you would turn to privileging a Madisonian meritocracy? Yes, my view is partly based on a realistic assessment of the existence of elite power and the need to quarantine it to a specific and limited role — proposing/advocating rather than disposing — as in Harrington’s constitutional proposal. But I also agree with Harrington’s view on natural aristocracy — that certain people, on account of a mixture of ability and motivation, will rise to a position of leadership. I also agree with your assessment of your state legislature colleagues, that a small minority of people are attracted to the benefits (and risks) that go with a life of public service (Hansen’s view is that the big mistake of modern representative democracies was to reduce the element of personal risk). This motivation may be on account of a wish for the perquisites of office and/or amour propre — the desire for distinction and to have the esteem of one’s fellow citizens. Rousseau saw this as a vice, but Mandeville pointed out how private vices can become public virtues. So, IMHO, elites are both inevitable and desirable, as part of a mixed system of government. I can understand how, as a socialist and egalitarian — “what if a society had no distinct class of wealthy people?”– you find such views obnoxious (to use Yoram’s favourite adjective). Although you put this just as a hypothetical question, I imagine that you would go along with the sentiment of John Lennon’s Imagine. To my mind such dreams all end in tears. PS I think the mistake of socialists is to view elites purely in terms of wealth. I agree that wealth is part of it, and that’s why Harrington argued for agrarian reforms to reduce the gap between rich and poor. But modern political elites (at least in the UK) are distinguished as much by cultural, motivational, ideational and cognitive factors as they are by economic ones. To a couple of voices of moderation here, I should say that “talk left, govern right” is the natural conclusion of moderation politics, that well-off politicians lie in their campaigns then schmooze with lobbyists in every corner. Keith, the growing wealth gap is too obvious for many to dismiss like you have. The cultural and cognitive factors tend to compound on socioeconomic conditions. Nonetheless, this book might be a good read on assembly democracy, bounded-delegate democracy, and sortitionist democracy, even if written by a support of polyarchy. Nobody is denying the wealth gap, merely the assumption of a homogeneous political/economic elite. The gap between political talk and praxis in a parliamentary democracy is more to do with (as Denis Healy put it) the laws of arithmetic, than evil lobbyists pulling the strings. We are all too beholden to crusty old books like The Ruling Class and The Power Elite. Wake up and smell the coffee. Who said Marx and the left have traditionally assumed a homogenous elite? Point fingers at us for already seeing the divide between the individual shareholder and the corporate executive since the 1860s and 1870s, for example. > Point fingers at us for already seeing the divide between the individual shareholder and the corporate executive since the 1860s and 1870s, for example. Interesting – can you point me to the sources? My references were to Mosca and Mills, as I’ve been banned from pointing out any connection between the writings of Karl Marx and the postings on this list. For some reason (that I don’t really understand) it’s viewed as a form of internet flaming. But irrespective of the provenance of this dualistic perspective, Yoram (for example) frequently draws a contrast between the interests of the “elite” and the “masses”, and both the syntax and the arguments he uses suggest that these are singular collective nouns. The two dusty old books that I referenced above (neither written by Karl Marx) adopt this perspective, which I don’t think is of much relevance to modern pluralist societies, which would be more accurately described as direct democracies by proxy, in which elected politicians desperately seeking to out-pander each other in the public opinion arms race. This is received wisdom amongst political journalists but academics, as usual, are around 50 years behind the curve, as was also the case at the time of Walter Bagehot, whose academic rivals still believed that the efficient seat of government was the chamber of the House of Commons (J.S. Mill doesn’t even mention the cabinet in his essay on representative government, even though all decisions were taken at the time by secret cabinet committee.) Fast forward to the end of the twentieth century and Prof. Vernon Bogdanor did not see fit to include a chapter on the media in his anthology on the British constitution even though the scheduling of cabinet meetings at the time was dictated by the requirements of the lunch-time news bulletins. And modern academics are still basing their “elite” theories on the canonical writings of Gaetano Mosca, Robert Michels, C. Wright Mills and (seeing as you insist), Karl Marx. The chapter of my thesis claiming that pandering is the name of the game has been greeted with snorts of derision by everyone in the politics department at my university, simply because all the evidence is derived from the scribblings of Grub Street hacks. After all what can a Westminster lobby correspondent possibly know about political theory? *** About the “dualist” social perception of Aristotle, I think it can be understood through the situation of the 4th century Athens. The low and medium classes gave their sons only an elementary education. When older, they worked, and any superior culture came from hearing plays in the public festivals or hearing orators. The “golden youth” had the leisure and the money to take courses from “sophists”, “professors of rhetoric”, philosophers, etc, and to discuss during symposia with people of similar class. That led to a very strong correlation between wealth level and cultural level, and therefore to the idea of civic collectivity containing two parts –the common people (dêmos in social sense), poor and of low culture (paideia) and the “gnorimoi”, rich and with high culture. *** I don’t know if there was more or less wealth inequality in the time of Demosthenes (and Aristotle) than in the time of Cleisthenes, but it is quite possible that, after the Greek cultural “miracle” the cultural differences were stronger, and, above all, there was a very strong correlation between the two dimensions. That was I think the basic weak point of the Second Athenian Democracy. *** Terry Bouricius, considering the old argument about the poor as illiterate, easily manipulated, etc. says that, supposing it was valid in ancient times, it is no more in modern societies. I agree, and it is a chance for modern dêmokratia. But I think there will be always the factor of correlation between dimensions. There are many dimensions in modern society, and many elites, and this is another chance for dêmokratia. But there is a correlation between two important dimensions, wealth and “cultural level”, not as strong that in the time of Aristotle, but not so weak. That is a dangerous source of anti-democratic feeling. *** If I understand Keith Sutherland, he thinks there will be always some kinds of elites, and that is good that the political system give them some room: by election – OK, as managers, not as representatives, by meritocracy – OK, with overseeing, and by “honors” as Demosthenes rightly insisted. The democratic problem is double: ensuring political competition inside the “political class” – here Athens was successful, and preventing the various elites from coordinating too much – and here Athens failed. *** Keith Sutherland thinks that the good political system will use the “good wish for the perquisites of office and/or amour propre — the desire for distinction and to have the esteem of one’s fellow citizens. Rousseau saw this as a vice, but Mandeville pointed out how private vices can become public virtues. “ Without discussing his interpretation of Rousseau, I agree that these desires for distinction can be used in dêmokratia and Demosthenes explained it well, in his speech against Leptines; but dêmokratia will not accept desires to have a specific part of sovereignty, which must remain in the hands of the dêmos, without distinction. I agree with you that the primary role of the elite should be managerial and that the appointment and reward mechanism should be meritocratic. I also agree that elites should not have a reserved role in the sovereign body. My perspective on sovereignty is Rousseauian — the demos meeting together should determine all legislative outcomes. If the assembly room (physical or virtual) is not big enough then a statistically-representative sample will suffice, especially as the causal power of individual votes in a large polis is virtually zero (thereby ruling out large-scale e-democracy). There is one small passage in the Social Contract where Rousseau shows that he might have been amenable to a sovereign legislature established by sortition. Where I think we disagree is when it comes to advocacy — to my mind this should be exogenous to the sovereign body and will, by default, be provided by elite rhetores, whereas your requirement is for endogenous advocacy. I’m sceptical, as you know, as to how your requirement is compatible with statistical representativity. Rousseau reserved deliberation and advocacy for the delegated (elected) government, and sought to insulate the sovereign legislature from factional and demagogic influence. But, given what you rightly say about the wider reach of modern education, to my mind a statistical sample of the demos is perfectly capable of judging the debate between competing advocates and determining the outcome in an epistemically (and democratically) sound manner. Notwithstanding this difference, I’m reassured that we all agree on the singularly most important point (that legislative decisions are reserved for the sovereign people). I would like to think that we could inch towards agreement on the outstanding problems of advocacy and the initiation of legislative proposals. The obligation is on me to demonstrate that the 4M + P (Marx//Mosca/Michels/Mills + Pareto) theory of elites is as anachronistic as the (equally dualist) Aristotelian perspective on class. Sociology is my own disciplinary speciality so I’m happy to pick up this gauntlet. Might I suggest that if you want to discuss arcane Marxian distinctions that you do this offline, otherwise I might be tempted to break the Stone Interdict and suggest that you are, er, Marxists. Note that my use of the term is descriptive rather than disparaging — as a good liberal I believe in freedom of religious association.